Mr. Juster is a master of language. Every sentence is a work of art. He has a quirky roundabout style that tucks the tail into the head, making each thought a complete circle. This makes you think, then it makes you smile. I think I’ll have to show you what I mean. See? It’s cleverly written. But about the time Milo visited the invisible city of Reality (it’s much more difficult to see than the city of Illusions, which isn’t really there), I started getting quite bored with the book. Oh, yeah, I’m not crazy about the 60’s cover and interior art, either. So I put it down and commenced writing this most glowing review I’ve ever done for a book I did not finish. I’d put The Phantom Tollbooth at a fourth or fifth grade level, but I fear quite a few kids wouldn’t be able to stick this one out, either. 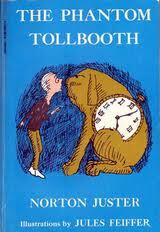 I had the same experience with The Phantom Tollbooth, but my wife absolutely adores it and has read it multiple times. Have you read his brilliant adult picture book, The Line and Dot? I have not, and now I’m really curious. I’ll look it up through the inter-library loan. I have never picked this one up. I have heard from people that it is amazing. I like that you pointed out what you liked about the writing and the story. Great review! I think this one could be a great divider–those that really like it and those that really don’t. There’s no denying Juster’s writing skills, however. This was the very first book I reviewed as a reporter for a newspaper. I liked the book, but have forgotten so much about it now. Juster must have done something right, because the book has stood the test of time — and sales. How interesting, Pat! When did you write your review?